The American Massage Therapy Association (AMTA) celebrates outstanding chapter members, as well as innovative programs and services offered at the chapter level. 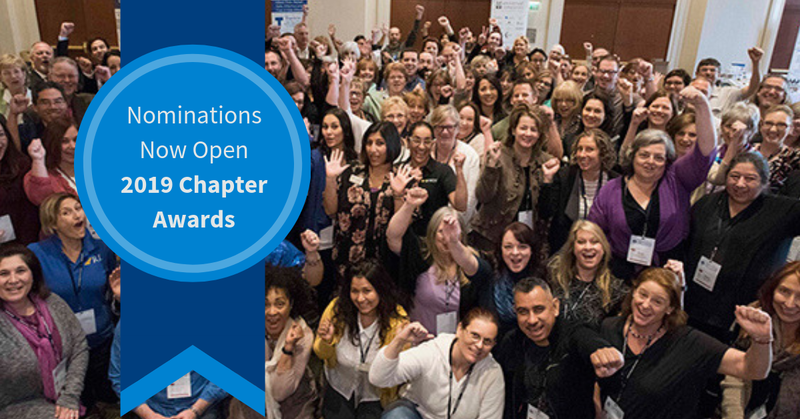 We are currently accepting 2019 nominations for the Chapter Meritorious and Chapter Innovation Awards. The Chapter Meritorious Award honors an individual who has accomplished diligence in volunteerism in an altruistic manner. Only one nominee from each chapter can be a recipient. We are accepting nominations for this award through April 30, 2019. We want to hear about the great things happening in our chapters across the country! The Chapter Innovation Award is a way for chapters to be recognized and share their success stories with one another. We encourage chapter leaders to share their “innovative” stories in the Recognition Zone Forum that is part of the AMTA Volunteer HUB – and your chapter could be the recipient of AMTA’s annual Chapter Innovation Award.